Toric Contact Lenses | Visionary Eyecare's Blog: "The Eye Journal"
Astigmatism is a refractive error – meaning that the light that is coming into the eye is not focused perfectly on the “film” in back of the eye (called the retina – which is a layer of nerve tissue). The retina is much like a movie screen or the film in your camera – the image must be focused PERFECTLY on the retina for the eye to see clearly. If the image is focused in front of the retina or behind the retina – much like a movie screen or camera film – the image will be blurry. This unfocused image is sent by the retina to the brain – where it is perceived as blurry, cloudy or distorted vision. Astigmatism is a refractive error caused when the front surface of the eye (the cornea) or the lens (which is located inside the eye behind the colored part of the eye – called the iris) is irregularly shaped and oblong – much like a football. This irregular shape causes the light to be focused on 2 seperate points – either in front of or behind the retina. This causes distortion of the vision and blur at all distances. So objects at a distance and also nearby are blurry and/or distorted. The higher the degree of astigmatism – the more distortion and blur you will have. Several methods can focus the light perfectly on the retina for you. Glasses, contact lenses (called astigmatic or toric contacts) or laser vision correction are aids that are available to help focus the light and images on the retina – which will get you to see clearly again! Video – What Is Astigmatism? 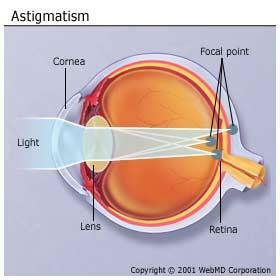 What Causes Astigmatism? Video - What Causes Astigmatism? Click the video above to learn what is the cause of Astigmatism. It is most commonly caused when the shape of front surface of your eye (called the cornea) is not perfectly round (like a baseball) but, it is more oblong shaped (like a football). When this oblong shape is located on the cornea then it is called “Corneal Astigmatism”. Less often, the lens inside your eye (located right behind the colored part of your eye called the iris) can also be oblong shaped. This is called “Lenticular Astigmatism”. Most commonly, people are born with this oblong shape to their eyes and often it can become a bit worse as time goes on. More rarely – astigmatism can be induced by a trauma to the eye. Astigmatism causes a blur and distortion to your vision – for both distance and near objects. The higher the amount of astigmatism – the worse the blur and distortion will be. Astigmatism can be corrected with a variety of options – glasses, contact lenses (called toric or astigmatic contacts) and laser vision surgery.